Hey hey readers, I'm skipping Part IV to come back to it. I didn't go bonkers and forget how to count... yet. My first full day in Nashville I visited the Frist Center for the Visual Arts. This was the first time I used the perks of being a blogger to get into a place for free. I walked in, wallet accidentally left at my cousin's place, sauntered up to the counter, and said, "Hey! I write for a travel blog. If I write an article for you, will you let me get in for free?" Surprisingly they were very accommodating, and here I sit on an air mattress in Cincinnati writing this post for you, telling you this. Apart from a section of mixed media symbolic work from high school students around the area and a N'Orleans pottery section (I just finished my trip there, what a coincidence!) They had the pièce de resistance: a car show with exotic Italian-designed cars from the mid-'50s to 1970. Among the cars were two in particular I'd like to show you, so you can see what interesting things can happen when you branch out and travel. 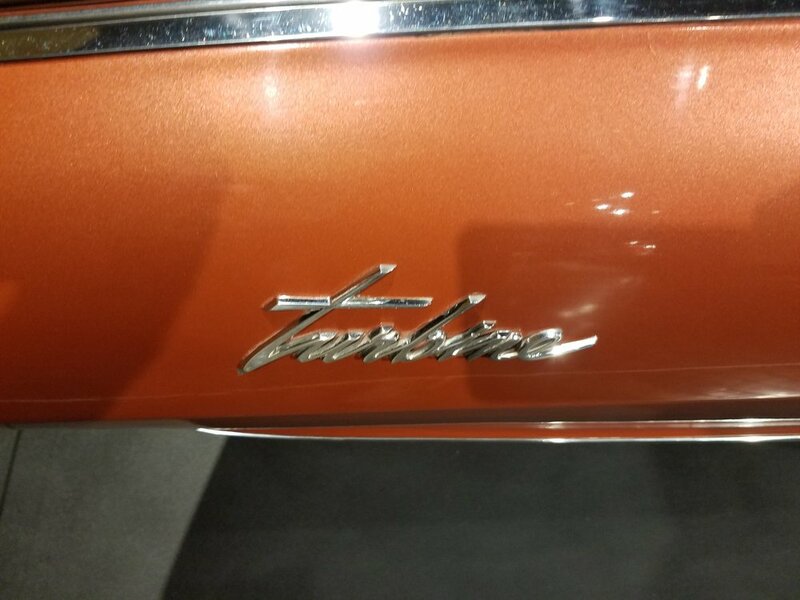 Have you ever heard of the Chevrolet Turbine? No? There's a reason for that. The Chevy Turbine ticked in a total of 55 finished cars, all of which are illegal to drive. Most of which were destroyed. 9 remain. Why were they ordered off the roads? I'll give you a hint, it's in the name of the car. No? The cars ran on jet fuel, using a real jet engine! That's right! I took some photos inside the car of the engine, which you can see inside the cabin from the windows. It reminds me of a scene in Inspector Gadget where the Inspector makes his car go 1,000 miles per hour. Of course the footage is just so sped up, but he was probably driving a Chevy Turbine in the true story. The other curious car was a small wedge, the roof just 32 inches off the ground. Getting in was a complicated endeavor involving turning a crank, stepping on a certain part of the car, moving the wheel aside to fit, and moving it back before you jet off like an angry piece of cheddar. Seriously, that's what it looks like. Legend has it, said the tour guide, that at a car show a rope was set at 3 feet, 36 inches. An attendant was about to take the rope down when the driver drove it right under the rope. Another useful statistic is that when you sit in one of the two seats, your bum is 1.5 inches from the squealing pavement. Sit tight! And that's the latest update from my trip! I'll double back and write about N'Orleans soon. Don't be afraid to ask for perks. I got into the Frist Center for the Visual Arts for free on a press ticket, there's no harm in asking!